Now Available. 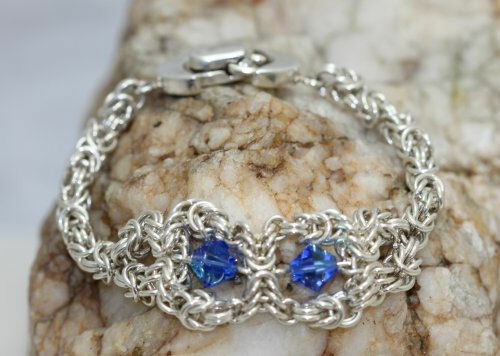 "Classic Chain Mail Jewelry with a Twist" is now published and available for purchase. I am so excited to have brought this book to you. There are twenty-eight sets of illustrated step-by-step instructions for you to make. This has truly been a labor of love on my part. I hope that you get as much enjoyment out of making these pieces of jewelry as I had in creating some of them and in writing the book. Please let me know your thoughts on the book. I have just added six new bracelets to the kit section. They are: Blingy Vision in Maille Bracelet, Bow Tie Bracelet, Chain of Links Bracelet, Coffee Bean Bracelet - Limited Edition, Double Delight Bracelet and Earrings, and Pillows in Maille Bracelet. There should be something in these that will interest each of you. There is "bling", vintage crystals and unique and interesting weaves. I hope that you will enjoy them. We are now offering silver filled jump rings and kits. They are beautiful, affordable and durable. I am sure that everyone has seen how the gold market has been climbing exponentially. Unfortunately, the silver market has been following along. I am happy to let you know that Steve has been able to find some suppliers that have silver filled wire for him to make silver filled jump rings. This is wire that is a hollow tube of silver that is filled with an alloy. We have found that jewelry made from silver filled jump rings looks just like solid sterling silver. It is also very durable and much more affordable. He has placed a silver filled jump ring option on his rings pages, so that you can buy them by the troy ounce at a much more economical price. We are in the process of adding silver filled kits to each of the jewelry kits on the website, but it will probably take us a couple of more weeks to complete. Megan, my daughter, is working diligently on it, but it is a time consuming job. If you find that you would like a kit that does not have the silver filled option listed yet, just email us and we will quote you a price. On another front, my book "Classic Chain Mail Jewelry" has gone into a third printing. I want to think everyone across the world who has purchased it. I am truly grately. 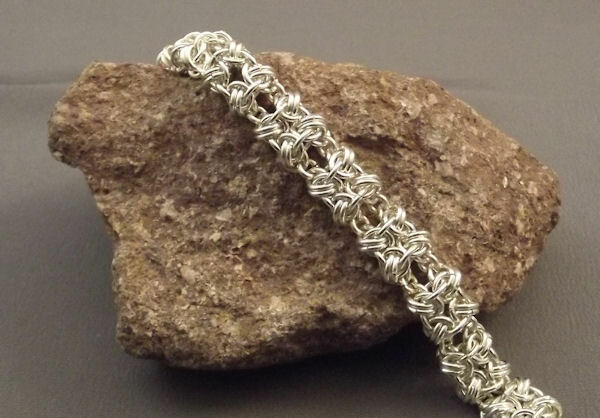 I am now writing a second book which is tentatively titled "Classic Chain Mail Jewelry 2". The publishers are targetting the first half of 2013 for its release. 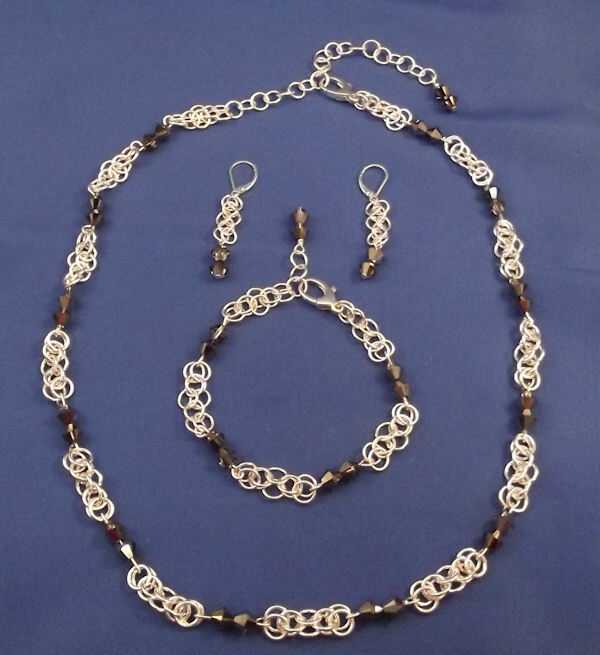 The book will have new information on chainmaille and about another 30 sets of directions for jewelry. I will keep you posted on its progress. I have also been working on some new weaves. Some of them can already be found in the Kit section of the website. 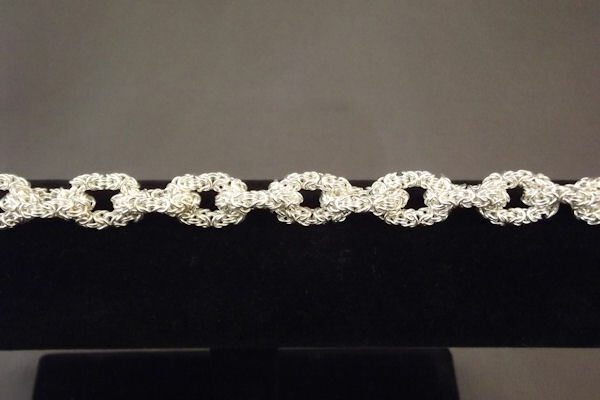 Some of the new ones are Chainmaille Lace Bracelet, Necklace and Earrings; Flight of Fancy Bracelet; River of Maille Bracelet; Crystal Maille Cuff Bracelet (utilizes many crystals and is full of "bling"). I have a couple of others that I am working on and will let you know when they are published. Hope that the Fall goes well for all of you. Keep in touch! It is great to be in 2012 and into a new season for beading shows. 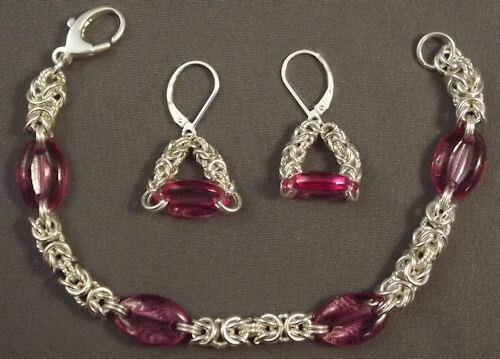 Please sign up for classes with me at Bead Fest Spring (Philadelphia) in just a couple weeks. Also I will be at the Bead and Button Show (Milwaukee) in June, Bead Fest Philadelphia in August, and Bead Fest Texas (Arlington) in October. I must say that you all seem to be loving the silver filled jump rings that Steve makes. They are truly an affordable but beautiful jump ring from which to make jewelry. I am glad to say that we have finished updating the kit section to include silver filled kits as an alternative purchase. I have just added some new items for purchase in the kit section of the website. Check out in the Bracelet Kit section: Honeycomb with Bling Bracelet and X's and O's Bracelet. Look in the Earring Kit section for the matching Honeycomb with Bling Earrings. Also, I have added in the Necklaces and Pendant sections: Byzantine and Stars Pendant and Earrings, and Chain Maille Lace Pendant and Earrings. Finally, in the Other Jewelry Kit section I have added the X Ring that is a compliment to the X's and O's Bracelet. These are all truly beautiful pieces of jewelry. I want to thank all of you who have purchased my book, "Classic Chain Mail Jewelry". I am happy to report that a second book is in process and that I will have more definitive information for you in June about it's coming.